TORRANCE, CA, USA - The Toyota USA Automobile Museum marked its “Grand Re-Opening” here today (2 November), with more than 100 models on display at its new, expanded facility. The Museum features Toyota, Lexus and Scion cars and trucks dating back to 1958, along with more than a dozen historic racing vehicles. A history of Toyota’s operations in the U.S. and around the world also is part of the Museum display. We're back ... though we have never left in the first place. When the site was launched in March, 2010 I hoped it would appear in Google search results by summer. It did not happen. There are a lot of potential explanations for this, but it slightly dimmed my enthusiasm for this project. A display of the works of GM Holden's first Australian Head of Design, Phillip Zmood. Zmood commenced his career with Holden in March 1965 working as staff designer on the HR, HK, HT and HQ range of vehicles. From 1969 to 1981 he worked as Chief Designer in Australia and Germany. Until 1995 he was the Executive in Charge of Design. He is credited with creating the major design elements of some of Holden's most iconic muscle cars. Toyota has endured the ups and downs of the automotive industry and has proved itself to be an auto manufacturer that is here to stay. This exhibit, sponsored by Elk Grove Toyota, explores the many different genres of automotive design and technology that are the foundation of Toyota's history. Some of the vehicles on exhibit will include a 1959 Toyopet Crown, a Prius Plug-In Hybrid, a 1967 2000 GT, a desert off-road race truck, and an IRL Indy race car. Come see the story of one of the greatest car manufacturers that is still thriving in the industry today! An Estonian Race Car Exhibition is being hosted at the Autoworld Museum in Brussels, Belgium between 22 June and August, 31. Displayed are seven racers: three Estonia 21.10's, one Estonia 22, and one Esttec 894. 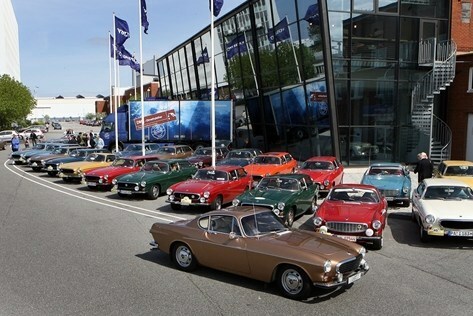 On Saturday 8 May, the Volvo Museum opens its doors for its traditional annual Activities Day. At the same time, there will be celebrations to mark the fact that it is 15 years since the museum was inaugurated in its spacious Arendal premises.